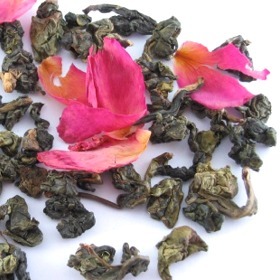 Rose Oolong Tea is produced by scenting Oolong tea repeatedly with fresh rose petals. Rose Oolong Tea produces a strong rose smell with oolong floral undertones and a soup of a pale yellow color. The Rose Oolong Tea taste is initially rose, but quickly blends into a mild oolong floral flavor. Taste smoothly with mild oolong floral flavor continuing into a sweet aftertaste. Rose petals mixed in with the Oolong tea leaves. Pale yellow color infusion. A delecate rose tea. It does not smell like roses, but still tastes great.